Are the Seattle Mariners finally starting to get healthy? 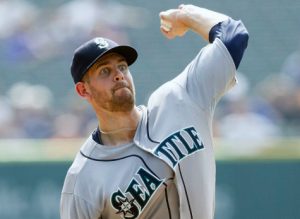 The Mariners have activated lefty James Paxton from the DL in time to start Wednesday against the Colorado Rockies, and a couple more of Seattle’s injured starting pitchers may soon be joining him in a rotation that has been beyond decimated by injuries all season. Paxton has been on the DL with a forearm strain for nearly the entire month of May. But prior to the injury, he was Seattle’s undisputed ace and one of the best pitchers in baseball. In six starts this season, Paxton is 3-0 with a 1.43 ERA. His return on Wednesday will be a massive boost to the Mariners, who desperately need to get things moving in the right direction if they’re going to remain in contention for a playoff spot through the summer. However, on the heels of four mediocre innings during a minor league rehab start at double-A last week, the Mariners are trying to manage expectations for the return of their ace. Paxton threw just 55 pitches during his one and only rehab start, plus another 10 in the bullpen afterward. He gave up two runs on five hits, striking out five. He likely would have benefited from at least one more rehab start, but Paxton has pronounced himself ready to return, and the Mariners are in a position in which they need their ace back as soon as possible, even if it means rushing him back just a little. The Mariners are hopeful that Paxton’s return is a sign of things to come, as Felix Hernandez, Hisashi Iwakuma, and Drew Smyly are also missing from Seattle’s rotation. Fortunately, Hernandez and Iwakuma are both making progress in their return from shoulder problems. Hernandez, who’s been on the DL since April 26, threw a bullpen on Tuesday and Mariners pitching coach Mel Stottlemyre Jr. says that he’s now ready to face hitters. Stottlemyre says Hernandez will likely throw a simulated game and then begin a minor league rehab assignment. No return date is set, but barring a setback, Hernandez should be able to return before the end of June. Stottlemyre was also impressed by the side session that Iwakuma threw on Tuesday. Iwakuma has been out since May 10 and is not far behind Hernandez in his recovery. As a result of the Mariners losing their four best starting pitchers to the DL, Seattle’s pitching staff has the highest ERA in the American League. The ship has all but sailed on the Mariners contending in the AL West, but they are still within striking distance of a wild-card spot. However, the Mariners are still five games under .500 and need to make a move soon to have a chance. With Paxton coming back on Wednesday and Hernandez and Iwakuma behind him, the Mariners may be getting healthy just in time to save their season.